Too Much Michael Jackson? : NPR Public Editor There is still a war in Iraq, Afghanistan, political uproar in Iran," wrote Carol Gendel. "In other words, real news to be reported. How much is too much coverage? Michael Jackson died a week ago, and as of today, NPR-produced shows have aired about 265 minutes (or 4 hours and 41 minutes) on the pop icon — not including the newscast coverage which initially was round-the-clock. In addition, there were numerous blog postings, videos, photos, photo galleries, timelines, and even the transcript of the 911 call. The West Coast bureau in Culver City is jokingly known as the Michael Jackson Bureau. Some listeners say they'd like NPR to stop because they've had enough. "While Michael Jackson's death is a major event in the pop music world, surely the wall- to-wall coverage can be delegated to Access Hollywood and the gossip magazines," wrote Carol Gendel of Rancho Bernardo, CA. "There is still a war in Iraq, Afghanistan, political uproar in Iran - in other words, real news to be reported." Gendel is not alone. A study by the Pew Research Center indicates that 64 percent of the people polled said the coverage was "too much." 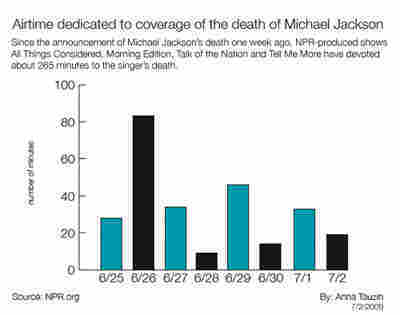 The Ombudsman's office decided to chart NPR's coverage since Jackson's death on June 25 in the late afternoon. Here's a link to all Jackson stories. NPR's Neda Ulaby and the arts desk got a full-blown Jackson obit on the air during the first taping of All Things Considered. "He was unquestionably either the most popular entertainer in the world or one of the most and one of the most unusual public figures on the scene in decades," said Steve Drummond, NPR's national editor. "It was a straight-up monster news story. He's been around since the 1960's and millions of our listeners grew up with him and watched him fall apart in front of our eyes. It certainly doesn't mean we are not covering the Bernie Madoff sentencing or the developments in Afghanistan and Pakistan." And if you think the coverage is over, you would be wrong. NPR's Avie Schneider wrote a piece today on all the outstanding questions. "Frankly, we'll continue to cover it because it's a story with big unanswered questions involving the custody of his children and tens if not hundreds of millions of dollars are at stake," said Drummond. Generally, when a major figure like Jackson dies, about a week is enough coverage. I, for one, am not interested in who gets custody of Jackson's kids. Update: The Project for Excellence in Journalism released a report on July 8, 2009 documenting the coverage of Michael Jackson by the news media. Read the study or view the full report.